One of the biggest reason why this idea of driverless and autonomous cars is catching up is that this will make the cars 'ride for all', one would have to spend hours and days at the RTO to get the driver's license to get behind the wheel. Let's talk a little more about this, while some would argue over the idea stating that development of self-driving cars for chaotic Indian roads is as feasible as setting up a hydroelectric power plant in the Sahara desert, however, this fascinating project has now put India in the race of developing the autonomous cars. Remember those days, when one would be surprised seeing a car driving on its own and later people use to term it as a ‘supernatural’ activity? Well, perhaps those were times when even the just the idea of car window rolling down by them self, would send chills through the body. During these times, the auto industry in India has grown at almost the speed of light. While many won’t agree to it, there are certain reports which prove it. For say, the transformation of Indian cars in fast few years has also opened the market for many world auto leaders here. As we all know there were not as many Lamborghinis roaming in India as there is today. But this piece isn’t about how Indian auto sector embraced the beauties, it’s more about how Indian automakers adopted foreign technologies to keep up with the pace. Currently, the Indian auto industry is gushing over the Tesla’s self-driving cars. A fun fact, most of the cars currently at the sale in Indian auto market come from foreign makers — Honda, Suzuki, BMW, Hyundai, Fiat, Chevrolet and the list goes on. As the times are charging, apart from making a mark in other fields, India is showing some significant growth. Joining the chorus of making driverless or autonomous cars, a small start-up in Kolkata has taken the first step in making self-driving cars a reality. Even though the concept, of a car without a driver is already being tested by Google and many more, the theory of ‘better late than never’ works for India. One of the biggest reason why this idea of driverless and autonomous cars is catching up is that this will make the cars ‘ride for all’, one would have to spend hours and days at the RTO to get the driver’s license to get behind the wheel. Let’s talk a little more about this, while some would argue over the idea stating that development of self-driving cars for chaotic Indian roads is as feasible as setting up a hydroelectric power plant in the Sahara desert, however, this fascinating project has now put India in the race of developing the autonomous cars. Bringing out the idea is Fisheyebox, from Kolkata. It is a tech start-up of just six people. The start-up has opted for Maruti Suzuki’s Celerio to incorporate their idea. According to a report by Autocar, which was present in Kolkata to test drive this ‘Project Aerodrive’, reads that this project has been put together on a shoestring budget of Rs 20 lakh, which is almost negligible to what other giants have invested. According to a report, Pinaki Laskar, who heads Fisheyebox, said, “We are at a ‘proof of concept’ stage, after which we are looking for investment to go to the next level”. The Aerodrive Celerio, which is one of its kinds, doesn’t come with a steering instead it works with a joystick. The joystick, replacing the steering in the car is essentially the controller to engage the autonomous driving mode. The Celerio also comes with a manual override that allows the driver to have the full control of the car. 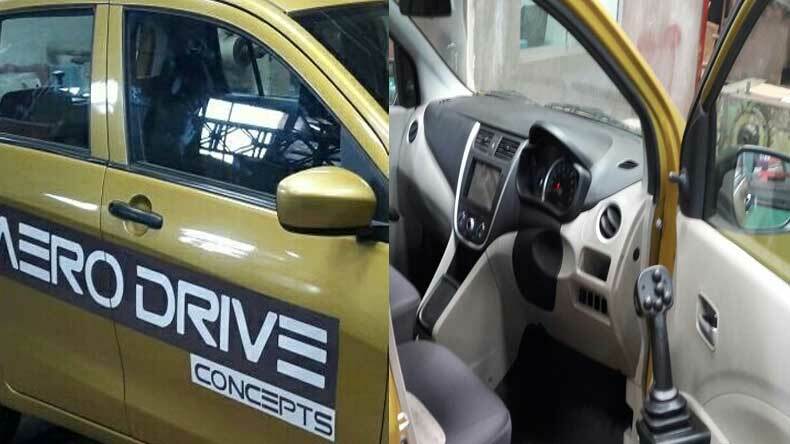 So what all did Maruti Suzuki Celerio give up to become Aerodrive Celerio? As per reports, the steering box, throttle body, and brake servo have been stripped out and replaced with potentiometers and servo motors linked to a black box which takes charge of the main functions – the steering, engine, and brakes. The Celerio works on the combination of visual data from a normal 720×1080 forward-facing camera and an Inertial Measurement Unit (IMU), which is a GPS, gyroscope and accelerometer rolled into one, and has a location accuracy up to 1cm. Apart from any sleepless nights and uncountable hours of work, the basic key to getting these autonomous car run on roads is the right hardware. Artificial Intelligence and Deep Learning are incredibly powerful types of software that crunch visual data in a way that makes a car think and take decisions. But first, a giant library of images and conditions that typical road users face has to be built up before the software can make a car respond in a particular situation. Even though this project highlights the giant leap which Indian auto sector has taken, the idea still seems far away from being executed as India still has millions of cars running without even basic safety features. Also, the way commuters drive is another problem which is pulling the transformation back.